WASHINGTON — European Deterrence Initiative funding continues to grow in the fiscal year 2019 defense budget request, this time by $1.7 billion. The FY19 request released Feb. 12 asks for $6.5 billion. The Pentagon requested $4.8 billion in FY18 and received $3.4 billion in FY17. The EDI account — initially called the European Reassurance Initiative — was created to help Eastern European allies rest easier and deter Russia from further incursion into Europe following its illegal annexation of Crimea and continued aggression in the region. The U.S. Army presence at the time of Russia’s move to take Crimea had dwindled from roughly 200,000 troops in Europe in the 1980s to around 33,000 in 2015. The Army had only two permanently stationed brigade combat teams, had closed over 100 sites since 2006 and was concentrated in Italy and Germany, nowhere near NATO’s eastern flank. Now the Army has another heel-to-toe rotational armored brigade combat team, which first deployed last year, and has already rotated in the next ABCT to take its place. And the U.S. Army is also part of a network of NATO Enhanced Forward Presence battle groups in Latvia, Lithuania, Estonia and Poland, set up in 2016 to deter Russia. The increase in EDI funding in FY19 reflects the continued concern over Russian activity and behavior and also reflects the new National Defense Strategy’s focus on China and Russia. The strategy lays out a world where great-power competition rather than counterterrorism will drive the Pentagon’s decision-making and force structure. The Army has typically held the lion’s share of the funding and this year is no exception. It’s portion in FY19 is $4.6 billion. Increased funding this year will cover more exercises, more forward presence and more improvement of the equipment that is forward-stationed. Now that the funding is focused on deterrence of Russian aggression rather than reassuring allies, more will be injected into munitions, improving tanks and Bradley Fighting Vehicles and priming the pump for a larger rotational presence in Europe that would be episodic and not always predictable, a defense official told Defense News prior to the budget release. The budget will not contain a request for additional troops in Europe in 2019, but more troops will be funded in 2020 when the Army begins a more dynamic employment of forces, which might include periodic exercises with multiple brigade combat teams and divisional assets, according to the official. And like the episodic and unpredictable rotational deployments, exercises will take on the same characteristics and will start to test the ability to withdraw and use the Army’s prepositioned stock in Europe, which by 2020 will be fully upgraded and complete, the official said. 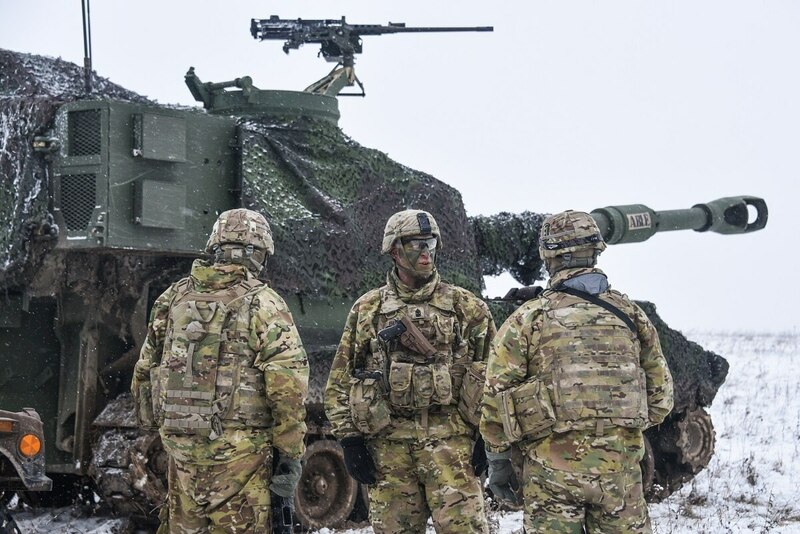 The EDI funding, as well as some base budget dollars, in FY19 would include equipment and weapon systems to complete a second set of Army prepositioned stocks in Europe, according to Davis Welch, the deputy director of the Army’s budget office. That equipment includes 40 Abrams tanks for $455 million, 61 Patriot Missile Segment Enhancement missiles for $261 million, 66 Armored Multi-Purpose Vehicles for $230 million, 61 Bradley Fighting Vehicles for $205 million and High-Mobility Artillery Rocket System rockets for $171 million, he said during a budget briefing at the Pentagon on Feb. 12.